Bathlifts cost from around £200, there are many variations and most have a reclining backrest that allows you to lean back slightly when you have been lowered into the bath. Try out both upright and reclining models to see which you prefer. You may be eligible for financial contribution towards the cost of a bath lift if you meet agreed local eligibility criteria. check how much leg room the bathlift allows you when you are in the bath. You can see and try bathlifts or request an assessment at your local Independent Living Centre contact 01743 250 820. Do you have enough leg room; Some bathlifts fit further back in the bath than others and give increased leg room - this is particularly important if your bath is short of you have long legs. 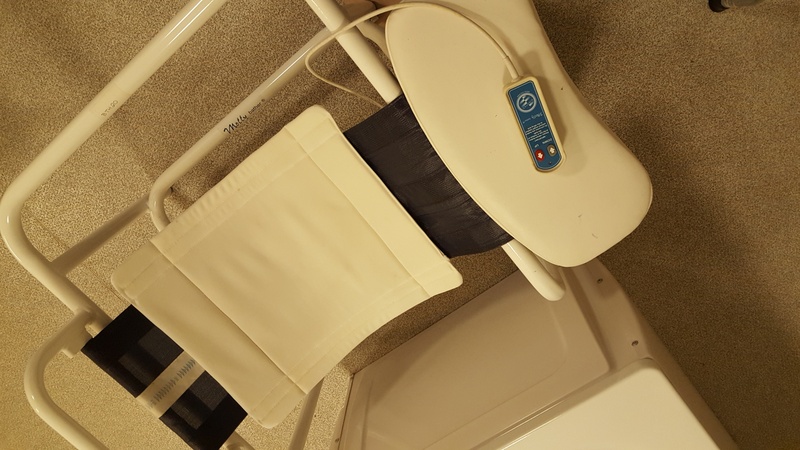 It is possible to sit on the bottom of the bath and lie right back with inflatable bathlifts and retractable band bathlifts. Powered bathlifts are usually quite bulky and heavy to lift in/out of the bath so they are best left in the bath when not in use. If others use the bath and do not wish to use the bathlift make sure that there is somebody fit and able to lift the bathlift out and replace it when necessary, and that you have a suitable place to store it when not needed. A bathlift should also be removed periodically for cleaning purposes. Is there someone who can do this for you? Bathlifts all have a maximum user weight limit so if any of the people using it are over 16 stone check the weight limit of the particular bathlift you are hoping to buy. 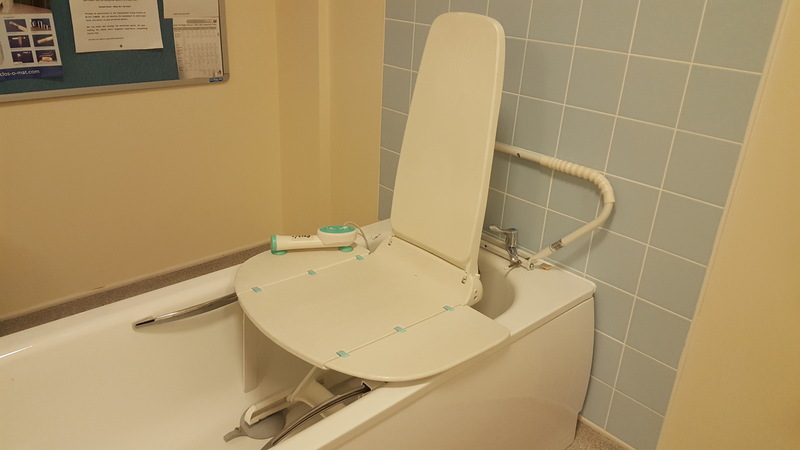 Bathlift may be available on loan from your local community services subject to you meeting the agreed local criteria and following assessment. Check with your local department if you hope to have one supplied on loan. Some bathlifts have a reclining back which may be more comfortable. Most bathlifts have suction pads to help stick to the bottom of the bath. sometimes if the bath has small bobbled surface it can prevent the pads from sticking. Some manufacturers have alternative smaller pads, it's best to check before hand with the supplier. Powered bathlifts will have side flaps that when level with the top of the bath allow you to tranfer off the bath. These can get caught on the way up if you have handles on the side of the bath, check with the suppier that they provide side flap guards to prevent this. 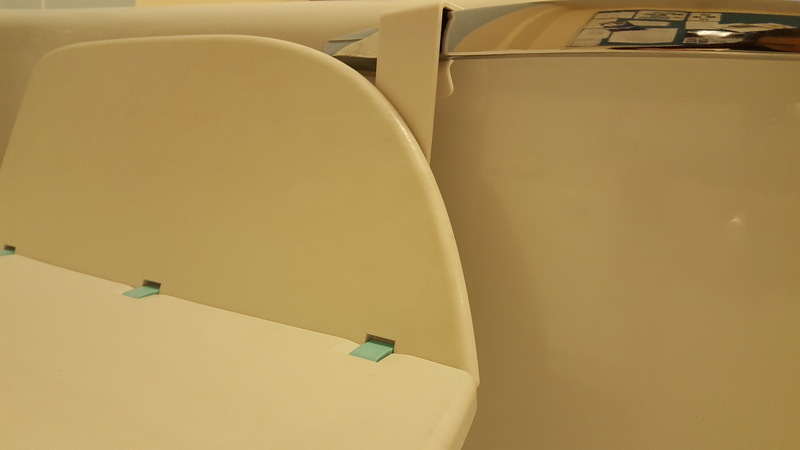 Most powered bathlifts do not allow you to sit right on the bottom of the bath (the seat usually stops about 3 inches from the bottom), and will not allow you to lie right back in the water. You will need to put more water into the bath to get the same depth of water that you are used to, and you may not be able to soak your whole back and shoulders. 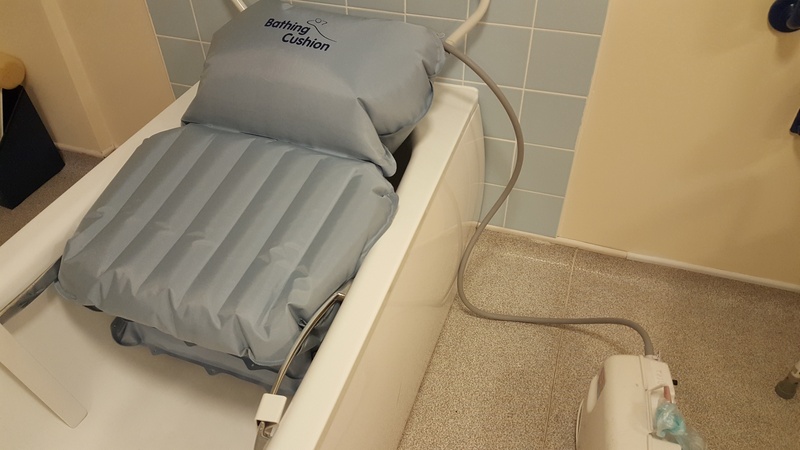 It is possible to sit on the bottom of the bath and lie right back with inflatable bathlifts and retractable band bathlifts (the type that have a wide band that reels out from a box fixed beside the bath), but you need good balance to manage either of these, and they do not assist you to sit up after lying back. Try out an inflatable bathlift or a retractable band bathlift before purchase to make sure that you can use it safely. Most powered bathlifts operate with a rechargeable battery that is safe to use in a bath. Make sure that you can operate the hand controls easily and also the re-charger. Also, be awarethat even a rechargeable battery will need replacing eventually. If you have an unusual shaped bath check that the powered bathlift will fit in. If you have an unusual shaped bath check that the powered bathlift will fit in it safely and that there are no features in your bath that would make it unsafe or unsuitable for a bathlift. If you use bath oils, check with the supplier that this will not damage the bathlift or compromise its safety. Make sure that you can get after-sales service if necessary and check out the likerly costs of this. The Lantern, Meadow Farm Drive, Shrewsbury, Shropshire, SY1 4NG.